The Micro Phone Lens is a tiny bit of optical-quality plastic that sticks to your cellphone’s camera lens, turning it into a 150x microscope. It just received $111,000 worth of crowd-funding via Kickstarter, most of it from coin and stamp collectors and a former Congressman from New York. Rome wasn’t built in a day but ten single-family homes were 3D-printed in a day by the Chinese firm, WinSun. The four 10 x 6.6 meter printers use “ink” composed of cement and construction waste. While the result looks a lot like a Tuff Shed, it costs only $5,000 per copy. Cutting the cord... A frustrated Ohio grandfather couldn't pry his "lazy" 17-year-old grandson away from computer gaming to help with chores. So he cut the cord -- literally, and then called 911 when the boy punched a hole in the wall in response. If I was grandpa, Sonny's first chore would be learning how to repair drywall. Ed Balls, a British politician became an accidental celebrity three years ago, when he accidentally "retweeted" his name, while searching for a pulled pork recipe on Twitter. Now it's become an annual event. The Heartbleed bug has sparked a flood of $3 million in cash donations to the Linux Foundation, which oversees the group of volunteers who develop and maintain the OpenSSL software that contained the Heartbleed flaw. Previously, the group was lucky to draw $2,000 in gifts per year. The “Bad Lepricon” malware have been discovered in several wallpaper apps on Google Play, leading researchers to question Google’s curation of its app store. The malware, since removed from the app store, surreptitiously used the host device to perform computation-intensive calculations called “Bitcoin mining.” Such apps tend to drain the battery faster, generate more heat in the device, and cause them to slow down. The head of Google+, Victor Gundotra, abruptly resigned on April 24 without stating a clear reason. Rumor has it that Google is de-emphasizing Google+, and will drop its recent experiment of requiring a Google+ account to use its other services. It’s estimated that 1000-1200 Google+ employees will be shifted to other departments. "Haven't we met before?" A face-recognition algorithm that does better than humans has been developed by Chinese researchers. GaussianFace software achieves 98.52 per cent accuracy versus the 97.53 per cent that humans average. Is Android's market strength an illusion? 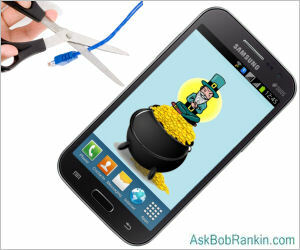 Is the highly-touted Samsung Galaxy S5 such a flop that carriers are giving it away free just one week after its debut? Is the number of phones “activated” during a quarter a reliable measure of its popularity? Netflix is pulling no punches in its fight to kill the proposed merger between Comcast and Time-Warner Cable. In its latest bid to avoid receiving invitations to Comcast parties, Netflix argued that the merger would give Comcast too much power to raise prices on content providers (like Netflix) and consumers. In completely unrelated news, Netflix telegraphed its intention to raise prices by one or two dollars per month, “depending on the country” for new subscribers. The price hike will help cover the peering fees that Netflix is paying to Comcast to keep streaming video fast and smoothly. Existing subscribers will keep their $7.99 rate “for a generous period of time.” "Generous," maybe, but not "crazy generous." Most recent comments on "Geekly Update - 01 May 2014"
Yeah, well, they've done some really strange and counter productive things with Google+. Like making it necessary if you want to rate and comment on an app in the Google Play store. Every time I go to do this I am invited to set up a Google + account so that I can. At that point I just say, "Stuff it!" and cancel the whole process. So the rating system must have taken a hit. And anyway, what's with calling it Google Play anyway? It gives their entire app store a thoroughly non-professional and entertainment only feeling. I much prefer Microsoft's simple and more pro sounding "Store". Bob,....Grammar comment.... I believe it's supposed to be "...a reliable measure..."
"Is the number of phones “activated” during a quarter an reliable measure of its popularity?" EDITOR'S NOTE: Typo fixed, thanks. Bob, your noting a article about the usage of 3D Printing was highly, interesting to me. I just read a medical article about the Surgical Team, making a 3D Printing of a young child's heart, so that they could really look at ALL the different issues, this young boy had, that needed to be corrected and to possibly, be done in one surgery. I can only say, it was awesome, to know just how much computer technology, is playing a complete role, in today's Medicine!!! Here's one article about this marvelous "miracle", in my book. I read my article, in a medical journal, newsletter or whatever. I was disappointed to see the reviews on Larson's magnifier (15x) on Amazon. I realize Amazon is not the only point of reference on a product but I do take it into consideration. 3D printing is over my head at this time...I need to do more reading but it sounds really neat and scarey. I am curious to know: How did you reach the figure of "146%?"